(I drew this Poe head. I just finished teaching a unit featuring several works by Edgar Allan Poe. If there’s anyone who teaches out there, you’ll know that teaching something forces you to not just learn the material, but become an expert. Especially when you’re teaching something… times five classes. And especially when you have 110 little heads asking you questions. But as a writer, I’ve also found that teaching what are often great works of literature offers me amazing insight on the craft of writing. At author events, people always ask for advice on becoming a writer. And very often authors answer that you need to read a lot. I think I’d go a step further. Reading a lot is great. But reflecting on and analyzing what you read is just as important to the growing process as a writer. I think this is why so many writers benefit from a good MFA program–because it forces writers to use these analysis skills with their reading. 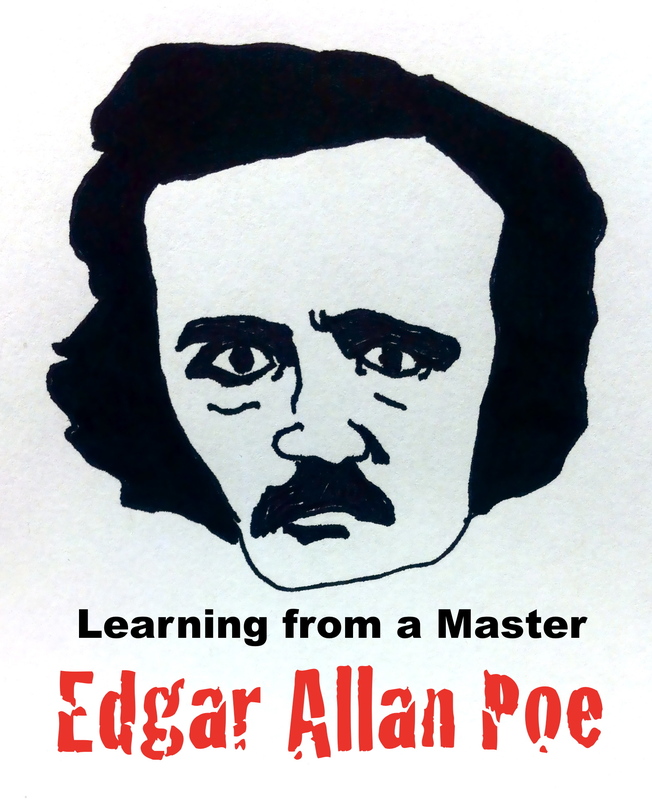 Anyhow, this post is intended to share one of the lessons I learned from Edgar Allan Poe. A pretty cool one, I think. Lesson from a Master Writer: Using consonance to create sound effects that mimic the action in your narrative. Using these two stanzas, we are going to look at how Poe used consonance to create sound effects that mimic the noises in the narrative. In the first stanza above (stanza 3 in “The Raven”), the consonant sound “s” is repeated in the first line, “the silken, sad, uncertain rustling.” What sound do you make when you want a person to be quiet? When you want silence? Shhhhh. The “s” sound is a soft sound as well as one associated with silence. And what is Poe describing using this soft “s” sound? The movement of curtains. Now say that line again. Go on. Say it out loud. “The silken, sad, uncertain rustling…” The very sound of that line mimics the soft sound of rustling curtains. Absolute brilliance. Let’s look at another. Especially when contrasted with the soft “s” sound of the previous stanza, the “p” sound is sharp and surprising. Think of the word POP! Or make the “p” sound with your lips. It’s a quick burst of noise. This “p” sound is again being used as a kind of sound effect for the narrative. These two lines are describing the knocking sound at the door. The quick, sudden burst of noise that has startled the narrator from slumber. When I read this line, every time I get to a “p” sound, I feel as if I’m hearing that persistent rapping at the door. The “p” sound even forms a sort of rhythm that one might use when knocking on someone’s door. So while “The Raven” is known for its lyrical rhyme and rhythm, I’d venture to say that Poe was one of Horror’s first sound effect artists. Poe knew how sounds affected a person’s psyche, and so he tried to imitate sounds with the words he chose. Thanks for attending my little lesson on Poe. I’d love if you left a comment to tell me your thoughts on Poe, “The Raven,” or the lesson post in general! Is this kind of post something you’d like to see more of on Hughes Reviews? This entry was posted in Writing and tagged Edgar Allan Poe.